Do you want to learn how your organization’s approach to use of GRC Technology compares to others? 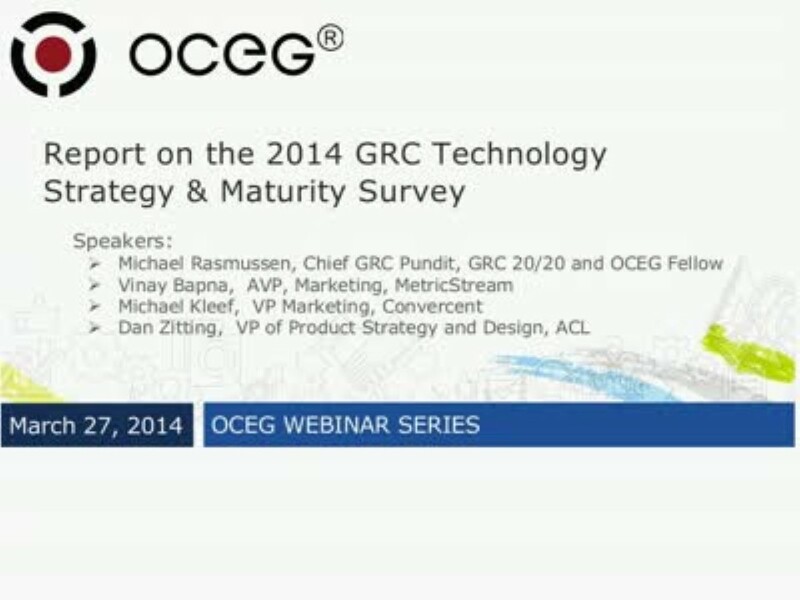 In this webinar, Michael Rasmussen will report on his analysis of OCEG’s GRC Technology Maturity Survey and will discuss the findings with experts from several GRC software providers. This survey was conducted by the OCEG GRC Solutions Council to provide information that can help to demonstrate the business case for improving the use of technology for managing the many aspects of governance, risk, and compliance in your organization today. We have emailed instructions to access Report on the 2014 GRC Technology Maturity Survey to . Make sure the email arrives in your inbox: either add "support@oceg.org" as a safe sender to your email platform, or if you use Gmail, drag our email into your Primary tab.